This blog is part five of our seven part HELOC series that will run through March 2019. Please visit the first blog in the series here, and return each month to view our latest addition to the series. appeal of your home’s exterior. Aside from the good feeling of pride in home ownership, it makes financial sense to pay attention to your home’s exterior. Many of your fix-ups will improve not only your home’s appearance but your property value as well. And it’s good to know that these improvements are among the biggest returns on investment. If you can’t afford anything else, a new front door adds instant appeal! Unlike other home improvement projects, this one is highly affordable. You can replace a weather-beaten door with a new steel door for a few hundred dollars, or you can splurge on a deluxe design. Either way, you probably won’t need a HELOC to finance a front door, but while you’re replacing the door, you should also upgrade your porch. People naturally gravitate to porches. Make sure that steps and railings are secure, and add a punch of color for pizzazz. You’ll enjoy spending more time on your porch, and you just might discover you have great neighbors! 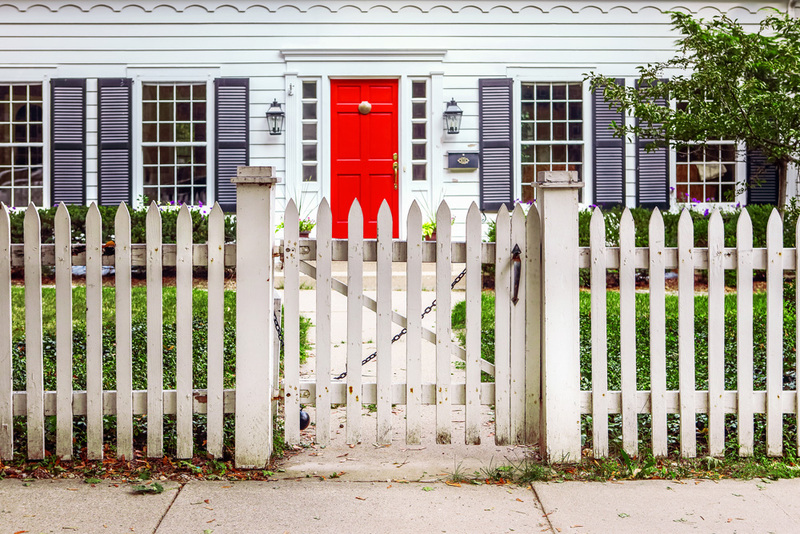 And if you’re putting your house on the market, a HELOC for improving your home’s exterior will help ensure getting potential buyers through the door. Using a HELOC to finance a new roof is more than an opportunity to upgrade your home’s appearance because an old, leaking roof can lead to structural damage. If you think a new roof is costly, imagine the cost of neglect! In addition to function, your roof can add color and style to your home’s appearance. It’s also worth looking into the newest options in roofing. Solar shingles allow you to create your own electricity while other shingles reflect solar rays, keeping your attic cooler and your energy bill lower. Or perhaps a steel roof would be a better option for your home. Don’t just settle for the least expensive option; your roof should be the crown jewel of your home. Another smart way to improve curb appeal is to upgrade or refresh your siding. Peeling paint not only looks bad, it isn’t protecting the siding underneath it. If you’ve had trouble with termites, consider investing in fiber cement siding. Cracks in the mortar only get worse over time. Don’t defer maintenance! Siding is more than a pretty face. Using a HELOC for your home’s exterior makes sense for a project this large. Brick exteriors have a reputation for durability, but eventually they may need to be tuck-pointed. Or if you’ve never liked the color of the brick, consider painting or staining it. If your ancient aluminum siding has developed dents over the decades, it’s time to ditch it. Vinyl siding offers a variety of colors and widths. Finding the perfect combination for your house will add value. And regardless of the housing market, an exterior upgrade will make your home a standout. Let the light in and keep the cold out! If you’re still coping with single-pane windows, you’re overdue for an upgrade. The days of storing and swapping out storm windows and screens are long gone. Invest in double or triple-pane windows with built-in screens. And unless you enjoy climbing ladders to wash windows, make sure you upgrade to tilt-in windows that allow you to clean them from the inside. Is the grass greener on the other side of the fence? Make your neighbors green with envy with a refurbished lawn. While you’re at it, prune or remove overgrown shrubs or trees and add perennials to draw attention to your home’s best features. You’ll be pleasantly surprised to learn what a smart investment new landscaping is for your bottom line. Using a HELOC makes good financial sense. Done right, your project can add more value to your property than it costs! And you get to enjoy a better view. When you’re ready to tackle your home’s exterior, United Financial is ready to set you up with a HELOC. Whether you want to take it one project at a time or do a complete overhaul all at once, a HELOC for home exterior improvements offers you the flexibility you need. Don’t you deserve a house that says, “Welcome home”?